NEW BRITAIN - The Goodwin Tech girls basketball may have lost its opening round contest in the CTC tournament to Bullard Havens 49-29 Tuesday, but Paola Barbosa reached a career milestone during the game. Barbosa scored 10 points and eclipsed the 1,000 career points mark for the Gladiators. She now has 1,001 career points and will look to build on it in the state tournament. Tanija Russell led Goodwin Tech with 11 points in the game. The Tigers had three players in double figures - Daniella Escobar, Jahnaisha Lee and Arianny Santana. With the loss, the Gladiators fall to 9-13 on the year and were eliminated from the CTC tournament. Parish Hill 47, Innovation 34: The Ravens played tough against the top team in Class S in the CRAL conference final on the road. 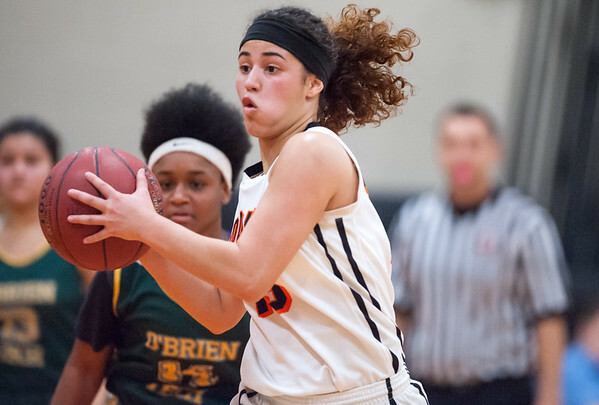 Ravens center Katarina Rodriguez had two points to go with eight rebounds and four assists. With the loss Innovation fell to 9-12 on the season. New Britain 60, Wethersfield 41: Up against a 16-win team and riding a nine-game winning streak the Hurricanes delivered a statement win. Thameen Dupree (17 points) and Moreese Turner (11) led the way for New Britain. Defense was big, though, against an Eagles team, led by Michael Mozzicato, that can score. Outside of his three 3-pointers, the Hurricanes were strong and held the secondary scorers to small point totals. New Britain finished 15-5 in the regular season. Posted in New Britain Herald, Goodwin Tech, Innovation, New Britain on Tuesday, 20 February 2018 22:39. Updated: Tuesday, 20 February 2018 22:41.